The NVT Phybridge 8-channel NV-8PS42-PVD is a key hybrid component that consolidates all CCTV system cabling using standard EIA/TIA 568B structured building wiring. Designed for installation in the IDF/Telecom Closet or MDF/Equipment Room, Power Supply StubEQ™ Active Receiver Hubs have individual floating 28VAC outputs that support at-distance camera loads up to 1 Amp per channel for cable runs up to 1,500ft (460m). 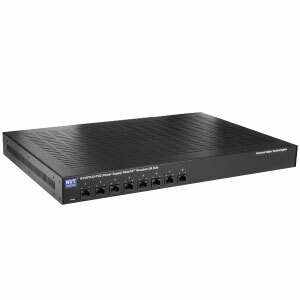 A built-in StubEQ™ video receiver hub ensures a zero loss video signal for connection into a DVR or IP encoder. Standard features include: per channel automatic-reset fault protection, transient protection, ground loop free individually floating outputs, and power and video diagnostics. All NVT Phybridge products are UL and cUL listed, are compliant with CE, RoHS, WEEE, and come with NVT’s lifetime warranty.